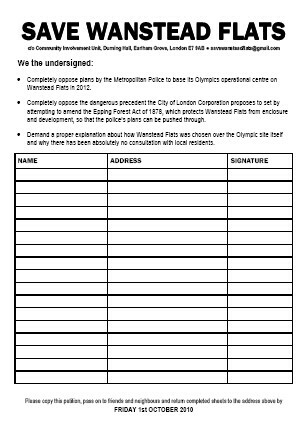 The Save Wanstead Flats campaign steering group met last night to finalise arrangements for next week's public meeting and now has a provisional figure for the number of signatures collected so far in opposition to the Metropolitan police's plan to set up on the Flats in 2012. Including the petition collection sheets that arrived this morning, there are 1324 people signed up so far in opposition to the plans, with a further 403 online. More completed petitions are expected at the beginning of next week and there are street stalls planned on Monday. It's not too late to collect more in support of the campaign - a copy of the petition can be downloaded from the campaign website. The request to take over the front row by the young people from Newham Woodcraft Folk, who asked some really smart questions when I met them a couple of days ago, has been agreed and I hope that one of their number decides to ask a question. Now we have to hope that as many people as possible turn up. The leaflet promoting the event is available here if you can help spread the word.